-I'm getting 12 minute 2-cup boils. Slow, I know, but I was nearly out of muffler wrap so i used mostly drywall tape. With a wick of mostly muffler wrap and a final wrap of drywall tape the burn times will come down, I'm sure. -Fuel capacity is over 7 oz. More than twice the capacity of a Trangia. -A weaker spring. The flashlight spring is waaaay too strong. It's got alot of promise for sure!!!! Great find on all the parts. 8 ounce capacity is way too cool. Has anyone ever done any pot height tests on a Trangia burner. Zelph??? Well its a toss up i find 1 in. to 1-1/4 in. is best off the top off burner.Some time just hold a pot over the buner go up and down till you get the right size flame under the pot. Thanks oops, I was thinking of doing the pot stand in such a way that it acts as a chimney as well. and i'm hoping that the chimney effect coupled with a few angled air holes, will allow the hot air to swirl underneath the pot and thereby loose less heat to the out side. the second part is to allow the user to lift the burner out and use it as a woodburner. Maybe of the zip variety. but i'll wait till i get it till i start this off, still working on my shelter. I half way made one out of a Rockstar energy drink can, but I forgot one major step I for got to seal it with JB Weld. I am still in the process of using it as a stove though it has a good flame pattern just need to work on a pot stand for it. Not I, oops would be the one that's up to date with that one. seudo_411 wrote: Has anyone ever done any pot height tests on a Trangia burner. Zelph??? i have. if you lower the stand from 'stock' the efficiency increases and boil times are longer. raise the stand and the opposite occurs. 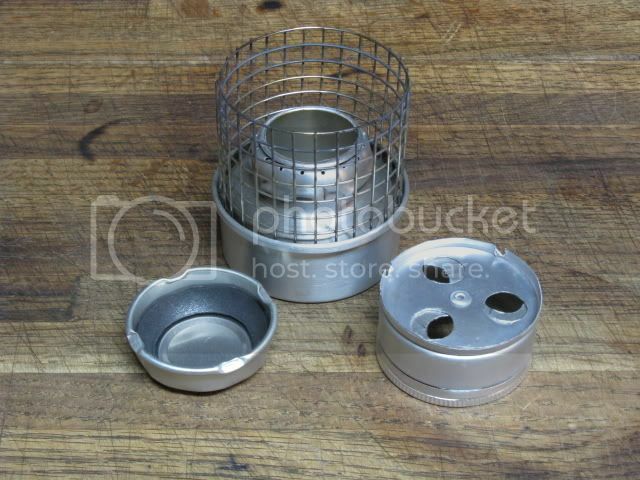 much like any other alcohol stove. So if i understand correctly, DarreN, You have had better results with a lower pot, and therefore slower air speed underneath the pot. This throws my chimney idea out the window, as i was hoping to gain more complete combustion by forcing air into the chimney area.